The following post is part of “Erroll Garner Tuesdays,” a semester-long blog series written by University of Pittsburgh music doctoral students in the seminar titled Music, Media, and the Archive: Jazz Collections of Pittsburgh. It was originally published by the University of Pittsburgh. 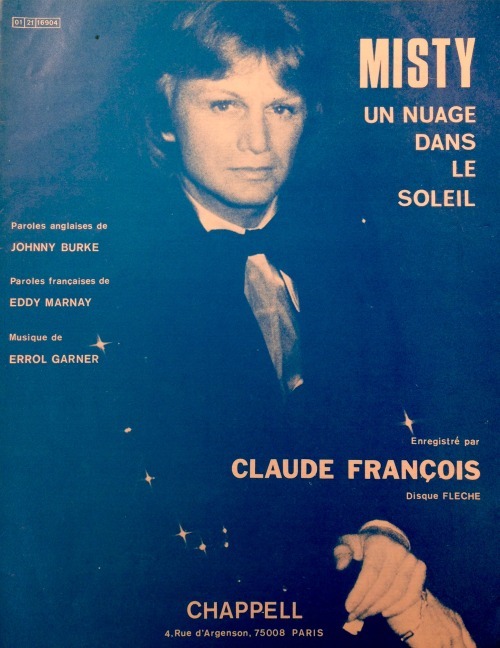 A publication of Misty by French publisher Chappell. As with many others, there is only a small mention of Garner’s authorship and his image is replaced by a white artist. Erroll Garner’s 1954 composition “Misty” was a ubiquitous standard that dominated the global jukebox. Singer Johnny Mathis sold a million copies of his vocal rendition from 1959. It won Country and Western singer Ray Stevens a Grammy Award in 1976 in the Best Arrangement category. The Association for Composers, Artists and Performers (ASCAP) named it as one of the twenty-five most performed standards of the 20th Century, trailing only “Satin Doll” as the most performed jazz song of the past sixty years. Many a singer made their career crooning this memorable and evocative melody, which begins on the Major 7th of the opening E flat chord (an unusual and challenging choice for a ballad). Yet in some ways Misty’s success did not ensure immortality for its composer. As Robin Kelley notes, “[B]y the mid-60s, [Garner] fades away and disappears. A lot of it has to do with the fact that he and his manager, Martha Glaser, decided to take on Columbia Records…[who] in 1960 began releasing unauthorized records, and he won” (Kelley). In Kelley’s analysis, the image of a black pianist who purportedly could not read music defeating a corporate titan was too challenging for the jazz establishment. Garner’s career faltered in the years that followed. Today, Garner’s position in canonic narratives is too-often minimal. The epic Jazz series by Ken Burns makes not a single mention. I agree with Kelley that his challenge to the power held by Columbia Records certainly was a major reason for the decline of his stature in the jazz mediascape. But in this post, I want to draw our attention to a less centralized, but no less violent, process of erasure: Garner’s almost complete invisibility from international sheet music publications of Misty. As we searched the Erroll Garner archive at the University of Pittsburgh for the complex and contradictory relations Garner struggled through as a black pianist in an America torn asunder by the dialectic of Jim Crow and Black Power, Garner’s presence via his absence in these publications spoke deeply to the times, both in the post-WWII era and today. This Chappell publication from Paris enacts a similar erasure of Garner’s contribution. Beneath an unbalanced title font, photos of several French artists (accompanied by the record labels on which they recorded the tune) are positioned off-center in a cascading descent. The viewer is asked to see the informality and countercultural aspects of “hot jazz.” Here black cultural production is interpreted by white Parisians as just plain fun. The cover becomes a site not to acknowledge a composer, but to promote recordings and sell products. Promotion goes both ways; images on the sheet music sell the records, but recognition from the records also sells the sheet music. A similar tactic is taken in this example from Argentina, in which the singer Nestor Fabian receives the most attention. This publication in Buenos Aires nonetheless goes to great lengths to explain this is the “version castellana”—the Castilian (Spanish) Version. Here Nestor Fabian’s smile, gaze, and perfect teeth command the eye. Yet again we see here the deployment of a mythical and chivalrous white performer inserted in the place of the composer himself. This American edition does not feature any arranger, or vocalist—but it still cannot bear to display Garner’s visage or give him any type of centrality. Instead, we gaze upon the emergent romantic sexuality of two white bodies in a grassy field, deliberately blurry (likely a pun on “Misty”). Is the blurriness an unconscious metaphor for the unconsciousness of whiteness of its own ontology? Taken together, it is difficult to ignore the whiteness embedded in these representations. We are reminded of Arjun Appanduri’s warning: “[O]ne man’s imagined community is another’s political prison (Appanduri, 295).” The images taken together foreground the imagined community of a romanticized whiteness that ignores its foundation: a black composer’s work. Our worldview becomes locked in the political prison of white supremacy. As W. J. T. Mitchell writes in his treatment of images from the minstrel classic The Jazz Singer, “The ocular violence of racism splits its object in two, rending and rendering it simultaneously hypervisible and invisible, an object of, in Fanon’s words, "abomination” and “adoration.”(Mitchell, 76) The invisibility of Garner makes him hypervisible; the adoration is displaced onto the imagined community of whiteness and white romance, and Garner is needlessly exiled from public consciousness and visual representation. The only exception in which a cover does portray Garner’s image is this edition from Tokyo’s Shinko Music Publishing. We see Garner transfixed at the piano, directly linking the composer to the importance of the song. The Japanese publishers found meaning in Garner’s importance in ways that their European and American counterparts did not. Without drawing too fine a distinction, this recognition meshes with the memories of many jazz artists about their reception in Japan since the 1960s. “They loved Art [Blakey]” recalled pianist John Hicks, noting that Blakey’s Jazz Messengers received no hostility from the Japanese, even though the band was playing coincidentally on the 20th anniversary of Hiroshima. We have observed how the international music publishing industry whitened Misty and erased Garner’s presence. Salim Washington reminds us that the erasure of authorship does not only do a disservice to the composer; it strips black music of its political valences and its implications for the social relations and structures of feeling in the community from which it arose. “While the underrepresentation of black cultural and intellectual achievement in the U.S. is a serious issue,” he writes, “what is at stake here is not the ethnicity of jazz musicians or their various racial subtexts attending the making of jazz icons. Rather, with this erasure, representations of the music’s aesthetic/social criteria and meanings are even more vulnerable to distortion (Washington, 28).” We not only lose Garner’s legacy, we lose the meaning of jazz, as a force for a more humane and democratic society. And that is Misty-fying, indeed.